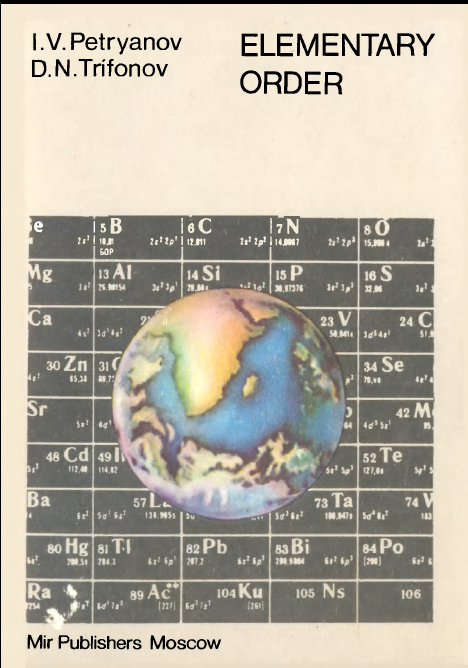 In this post we look at another book by I. V. Petryanov and D. N. Trifonov (whom we have met earlier in a Science for Everyone book titled Silhouttes of Chemistry) This book traces the history of development of periodic table and is titled Elementary Order: Mendeleev’s Periodic System. Also we see how we have developed a better and deeper understanding of the order in elements after advent of quantum mechanics . The book was translated from Russian by Nicholas Weinstein and was first published by Mir in 1984. Many thanks to gnv64 for this book. This entry was posted in books, chemistry, history, mir books, mir publishers, physics, science and tagged artificial, atomic structure, chemical, elements, history, mendeleev, order, periodic law. Bookmark the permalink. The print is not very clear. The pages are very blurred and the images are not clear either. If it is possible could you pl upload a clearer version.